Why Should a Ceiling be Cleaned? Vinyl ceilings are power washed and wiped dry to remove the “brown tint” that accumulates from grease, oils, steam, and outside soot. Our chemicals clean and sanitize the tiles. Vents and lights are cleaned to give your ceiling a fresh look. In addition to an improved appearance, these processes also eliminate unpleasant odors. When your ceiling is left unmaintained, it can lead to a situation costing thousands to replace completely. Ceiling Ease, not only cleans, but repairs ceilings, replaces broken tiles, rusted grid, and vents. Proactive maintenance prevents damage which saves you time and money. Cleaning brightens and prolongs the life of your kitchen ceiling. A clean ceiling contributes to an attentive, professional image of your food and employees. This is important for restaurants and food preparation companies where cleanliness is critical for confidence and satisfaction. A clean professional looking ceiling will you help pass health inspections and corporate audits. You will also find that employees set higher performance standards when they work in a clean, healthy, and sanitary environment. Clean ceilings and FRP walls make a room brighter and improves moral. At Ceiling Ease, our goal is to improve and maintain the look of your ceiling so that you and your staff do not have to. This gives you more time to focus on what you are good at and prevents employee injuries. How Do Ceilings Get Clean? Ceiling Ease comes to your business to take measurements. Then we will provide a free written estimate. We schedule our trained crews to accommodate you. We work after hours, weekends, during your non-peak times, if you are open 24 hours/7 days a week. Our work crews spend time preparing your area to be cleaned. Equipment, furniture, and shelving are moved or tarped, as appropriate. Your ceilings are cleaned overnight. 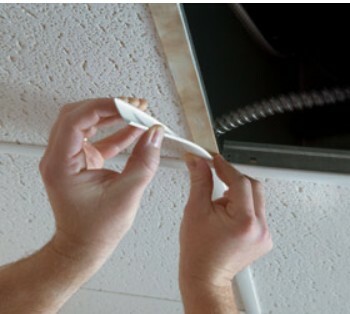 Ceiling Ease can repair, replace ceiling tiles that are damaged by moisture, AC repairs, or the hanging of decorations. Rusted or clogged air diffusers? Replace them with vinyl units that will not rust, are easier to clean, maintain and gives your ceiling a new professional look overnight. 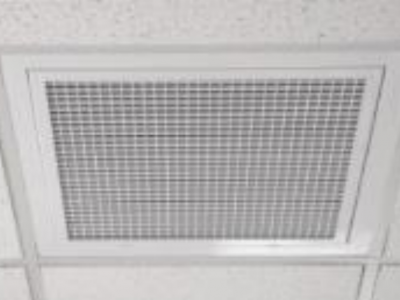 Vinyl vents are ideal for maximizing air flow in kitchens, can easily be taken down, cleaned, and returned in a matter of seconds. Ceiling Ease can also replace cracked or discolored light lenses with a thicker, more kitchen friendly lens. This will improve the lighting, prevent warping, cracking, damage, and prevents injury from falling lenses. Those rusted t-bars can be replaced or covered with vinyl grid. Vinyl grid covers, not only protect the metal bars, they minimize rusting. Make the rust go away instantly. Get a new look overnight without a permit. If your ceiling sags, let Ceiling Ease level it for you before this problem becomes bigger and costlier. A sagging ceiling only gets worse. Let Ceiling Ease clean and maintain your kitchen ceiling. Acoustical ceilings are sprayed and the metal t-bar wiped dry. Our chemicals clean (bleaching agent) and sanitize the tiles. Vents and lights are cleaned to give the ceiling a fresh look. In addition to an improved appearance, these processes also eliminate unpleasant odors. When a ceiling is left un-maintained, it can lead to a situation costing thousands to replace completely. Ceiling Ease, not only cleans, but repairs ceilings, replaces broken tiles, grid, and vents. Proactive maintenance prevents damage which saves you time and money. Old tiles accumulate layers of dust. The mildew smell permeates your office and offends customers as they enter. Spray the tops and bottoms can remove those smells. Odors can be removed overnight. A clean ceiling contributes to an attentive, professional image of your office building. This is particularly important where cleanliness inspires confidence and satisfaction. A clean professional looking ceiling will help pass health inspections and corporate audits. You will also find that employees set higher performance standards when they work in a clean, healthy, and sanitary environment. Clean ceilings make an office brighter and improves moral. Ceiling Ease comes to your office to take measurements. Then we will provide a free written estimate. Our work crews spend time preparing your area to be cleaned. Equipment, furniture, and shelving are moved or tarped, as appropriate. Your ceilings are cleaned overnight or on weekends. Rusted or clogged air diffusers? Replace them with vinyl units that will not rust, are easier to clean and maintain, giving your ceiling a new professional look overnight. Ceiling Ease can also replace cracked or discolored light lenses with a thicker lens. This will improve the lighting and prevent warping, cracking lenses and prevent damage or injury from falling lenses. Better lenses cause less eye strain for employees. If you are in a high moisture area your metal t-bars may be rusted and ugly. Those rusted t-bars can be replaced or covered with vinyl grid. Vinyl grid covers, not only protect the metal bars, they minimize rusting. Make the rust go away instantly. Get a new look overnight without a permit. If your ceiling sags, let Ceiling Ease level it for you before this problem becomes a bigger and costlier. A sagging ceiling only gets worse. Let Ceiling Ease clean and maintain your ceiling.